Tru-Spec's Cordura NYCO fleece job shirt isn't just for days off. Fashioned from a blend of 78% cotton and 22% CORDURA® nylon fleece, the fabric meets the NFPA 1975 certification standards for flame resistance and won't melt or drip when exposed to heat. The job shirt is well-suited for wearing underneath duty gear as well as relaxing between calls. 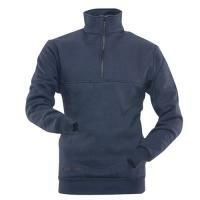 The durable fabric, with combined long sleeves and tall collar, provide full-body warmth. The half-zip design through the collar also allows for easy ventilation and the front yoke contains a useful interior pocket. Stretchy knit cuffs at the wrists provide a snug fit that leaves your hands free.